Webcams are very common nowadays and most, if not all modern laptops come with one built-in at the top center above the screen. It can be used for a lot of different purposes such as making a video call (chatting, demonstration, conference, webinar), taking pictures of yourself and even logging in to a computer using face recognition. A webcam can also be used as a surveillance camera by installing the correct software and configuring it to automatically record videos, notify you via email and perform custom actions when a motion is detected. This allows you to setup a powerful home based CCTV to monitor a section of your home which is most likely a source of break-ins without spending unnecessary money to install an expensive complete home surveillance system. There’s a number of software applications that can turn your computer and webcam into a surveillance system, each has its own pros and cons with different features. There are some that are difficult to configure which are meant for more advanced users while there are also user friendly ones that are lightweight. Below you can find our recommended list of 12 free webcam monitoring software based on your needs. Camera Viewer Pro is one of the best in terms of usability and system resource usage. It comes with the right balance of features which makes the program easy to use and configure. 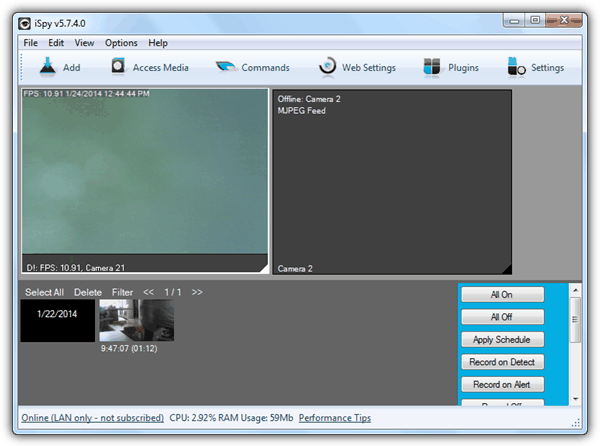 Moreover, normally a video surveillance software will constantly hog the CPU but Camera Viewer Pro is very intelligent and uses merely 0%-1% of the CPU during monitoring. The only thing that you may want to change in the settings after adding a camera is the Frame Rate which by default is 1. A higher FPS gives a smoother recording but you’ll need to decrease the sensitivity level by lowering the threshold level. The only drawback on Camera Viewer Pro is that the official website is no longer accessible which means that the development has stopped. It was last updated in April 2013 and fortunately works perfectly in Windows 8. 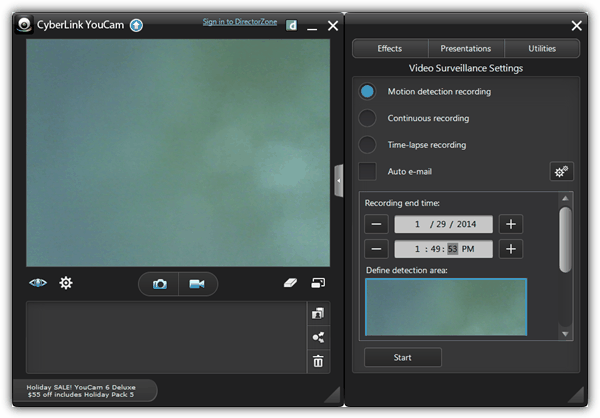 ContaCam is another free video surveillance software that is just as good as Camera Viewer Pro. It has all the necessary features to turn your computer into a CCTV system but the scheduler is a bit limited where you get to specify only one range of time frame per day for motion detection recording. Do take note that by default ContaCam saves the recording as a SWF animation for motion detection. It is very rare for a video surveillance software to use SWF format for recording because of the 16,000 frame limit. That would mean you only get to record nearly 9 minutes of video if you set it to use 30 frames per second. You can of course change it to AVI at the Movement Detection tab in “Device Settings”. Genius Vision NVR is an enterprise-grade IP camera recording shareware originated from Taiwan. They offer a free version called the Community Edition with full functionality but it has a limit of 16-channels with 4-channel intelligent video which is mostly enough for non-commercial use. Out of all the video surveillance software listed on this page, Genius Vision NVR CmE is the most difficult to use and configure because of the different terms that are being used on the program. For example, the motion detector is called the “Video Analytics”. The online user manual documentation is not much of a help either. The graphical user interface (GUI) looks a bit dated like it has been made for Windows 98/2000. We experienced a few crashes when testing out this software. iSpy is an open source camera security software that comes with a huge list of features including audio monitoring which is rarely found in video surveillance software. Because of its rich set of features, there are many scenarios and uses of iSpy such as monitoring a sleeping baby, machinery, nanny, pets, staff and etc. iSpy is a good example that not all open source software is fully functional. Although iSpy comes with a huge list of features, there are some very basic functions such as remote access streaming and email alerts that are only available for paid subscribers. Furthermore, there is an annoyance in playback where by default it plays in iSpy which requires you to sign up for a free iSpy account when all it does in the end is play using your default media player. From the creators of the popular WebcamXP and Webcam 7, Moonware Studios have developed a new product that is similar to their previous webcam software except using a new architecture and graphical user interface for better performance. You can expect a huge list of supported and pre-configured network cameras to make configuration easier. 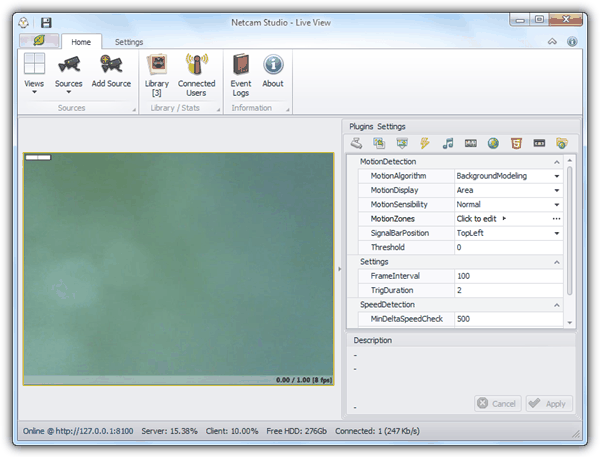 If you are looking for a video surveillance software that is packed with features, Netcam Studio is the answer. Apart from the common features found in a video surveillance software, Netcam Studio has audio detection, license plate recognition, sync recordings to Cloud and NAS. Do note that Netcam Studio is still in beta and we’ve encountered problems during installation itself, but managed to get it installed by custom installing one module at a time. Both .NET Framework 4 and Visual Studio 2012 C++ redistributable are required by Netcam Studio. The free version embeds a non-intrusive watermark of the Netcam Studio logo at the bottom of the recorded video which blends in nicely with the time overlay. Instead of a full featured camera surveillance software, Rear View Mirror is a pretty simple one with its own unique feature where the window of the monitored camera only shows up when motion is detected. It can also be configured to enable sound alert playing your favorite .wav file and record a video on motion alert. Despite not having a lot of security camera features, Rear View Mirror uses up quite a lot of CPU power ranging from 17%-20% when tested with only 1 webcam. 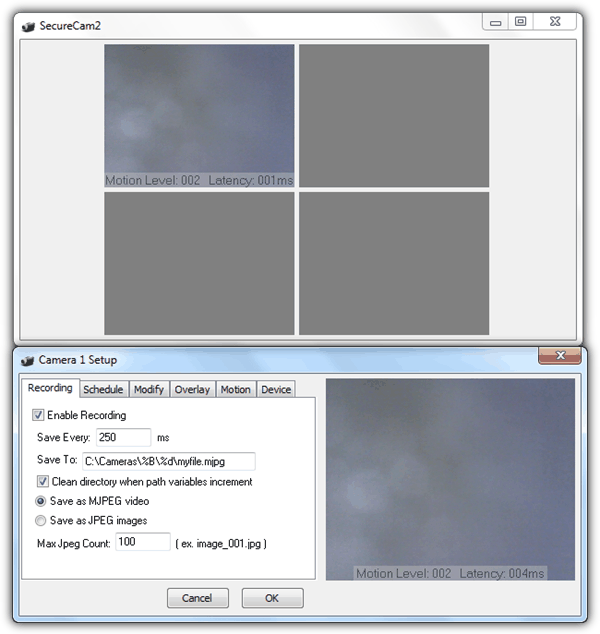 The SecureCam2 installer size is the smallest at only 343KB but it has all the necessary basic features for a security camera software. You can find the ability to manually record or automatically record based on schedule, detect motion, embed a text overlay to frames and a web server for online streaming. It also includes a player to play the MJPG recordings. The only limitation in SecureCam2 is it only supports up to 4 cameras. A donation to the software author will increase the limit to support 100 simultaneous cameras. Go to page 2 to continue viewing the remaining video surveillance software and also the features comparison table. 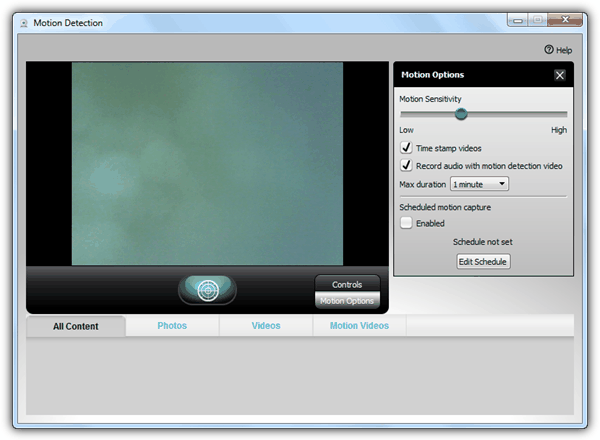 Sentry Vision is free webcam surveillance software that only works on webcams and not on IP cameras. 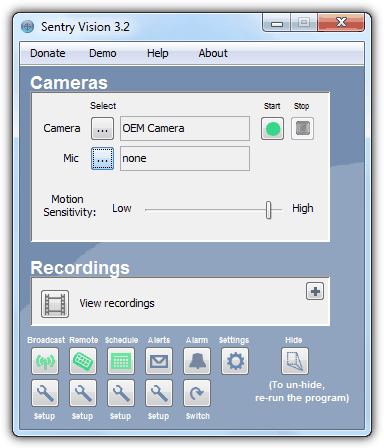 It can record both video from a webcam and audio from a microphone if it is available on the computer. Motion detection, broadcast, schedule, email and sound alert are included. Two unique features that can be found in Sentry Vision are the ability to remote control the software by sending commands to a listening Gmail account and also the ability to hide the program so that normal users won’t know that the webcam is being monitored. There is a password protect function but didn’t work for us. Previously known as Vitamin D Video, Sighthound Video aims to be a more intelligent video software by being able to recognize humans or objects on camera rather than simply detecting motion through frame comparison. After adding a camera, the actions can be easily configured from the flexible rules editor. It comes with a remote access option to turn on or off the camera and view recordings. Sighthound Video is very user friendly but it runs multiple processes that take up a huge amount of memory. The free version of Sighthound Video is limited to only 1 camera with low resolution recordings. Believe it or not, Yawcam has been around for a decade! Although Yawcam’s development isn’t very active, the author of this video security software has at least made an effort to keep the project going by releasing updates from time to time, mainly to fix bugs. 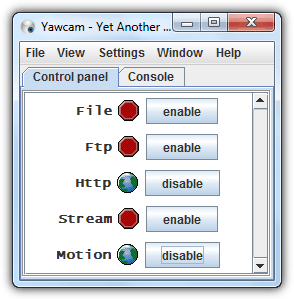 Yawcam supports both webcam and IP camera, has motion detection with actions such as save file, ftp upload, send email, run executable file, or play sound, video streaming from built-in webserver and overlay. 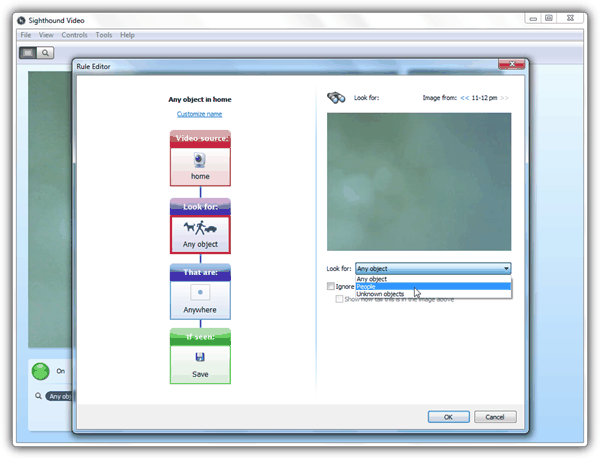 Yawcam requires Java to run and it is the only video surveillance software that outputs the recordings as images and not video. It does however come with a built-in tool to merge multiple images to a movie file. 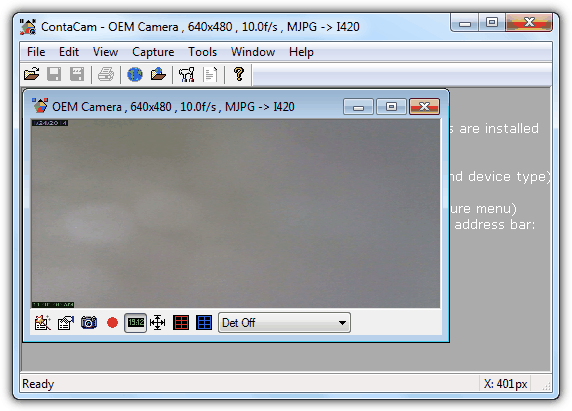 A free version of Cyberlink YouCam software can be found bundled into HP laptops and some OEM webcam. Starting from version 2, it comes with motion detection recording which turns your webcam into a basic security camera. As you can see from the screenshot above, you are only able to set the recording end time and define the area that you want to detect for motion. Oddly the auto e-mail feature is disabled in version 5 prompting you to upgrade to a paid version 6 while it is fully enabled in version 4. So if you need to be notified via email when a motion is detected by Cyberlink YouCam, use version 4 instead. Since Logitech is a commonly used webcam, we thought we should mention that the Logitech Webcam Software comes with a very basic Motion Detection module that is able to automatically record both video and audio when motion is being detected. Some branded computers such as Dell can use Logitech webcams which makes it possible for the software to be installed and used. To determine if your OEM camera is Logitech made, look for 046D in imaging devices hardware ID from Device Manager. You are able to set the motion sensitivity and maximum recording duration, time stamping recorded videos, simultaneously recording audio with motion detection video and scheduling motion capture. Below you can find four comparison tables which we’ve created to easily compare the features and usability of the 12 video surveillance software listed above. 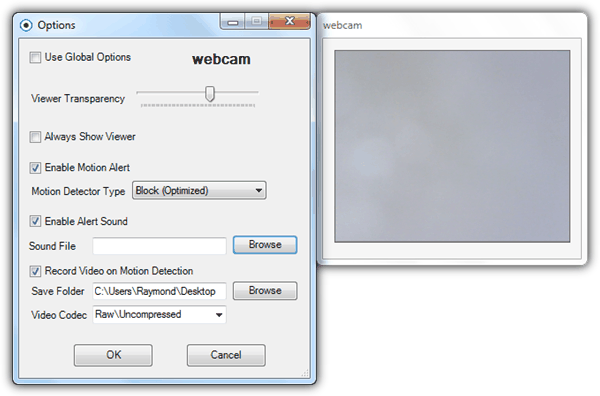 The main features table above shows that all software supports webcam and motion detection. Audio/sound detection is only supported by iSpy and Netcam Studio which can be used as a baby monitor to alert you if it detects a baby crying. 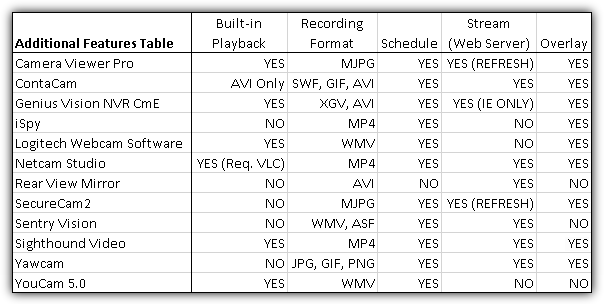 The additional features table above shows if video recordings can be played back directly from the software itself or you have to manually locate the video files and play them with a compatible player. You can also find if the video surveillance software can do live streaming automatically or through manual refresh. Rear View Mirror, Sentry Vision, Sighthound Video and YouCam don’t have text overlay support to embed additional information such as the time and date of recordings to the video. It is important to configure the motion detection actions correctly. You may want to be notified via email or SMS when a motion is detected so that you can instantly login to view the live stream, automatically upload the snapshots/recordings to a remote FTP server in case the burglar takes away your computer/laptop, run some custom actions such as playing a really loud warning sound and turning on the lights as a deterrent. This last table shows the user friendliness of each video surveillance software because some of them can be really difficult to set it up correctly. 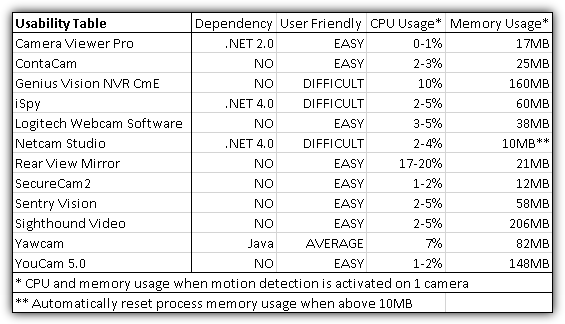 Do note that the CPU and memory usage shown in the table are taken when motion detection is enabled on 1 webcam. The best webcam surveillance software? Our current favorite choices would be either Camera Viewer Pro or ContaCam mainly because both are very light on system resource usage, easy to use and have nearly all the important features. Camera Viewer Pro has a very flexible scheduling functionality where you can create multiple schedules per day while ContaCam only allows one. ContaCam has an additional feature for advanced users that will allow you to execute a custom command with parameters which is not available in Camera Viewer Pro. In short, ContaCam is more suitable if you need to execute custom commands. Otherwise Camera Viewer Pro is an excellent choice for multiple schedules. If you prefer something that is really easy to use, Sighthound Video’s step-by-step camera setup wizard gets your webcam up and monitoring in just a few mouse clicks. Netcam Studio has a lot of potential because it comes with tons of features except the developers still need to work hard on the stability to get it out of beta development stage. Additional Tip: Even though most of the mentioned software above doesn’t support SMS notification on motion detection, it is still possible to receive SMS alert by using World-Text’s Email to SMS Gateway. You’ll need to sign up for a free account, top up credit and register your mobile number so that World-Text will forward any email message to the given number via SMS. Sight hound Video does not have Motion detection in free program anymore! 23/july/2017, I just checked the security eye web site, it is not free. why are you saying it is 100% free ? Security eye for the win! The information is useful, but it is already outdated. It would be nice to update and add to the review AnyCam, Ksenos and Macroscope. Very Purposeful Post, Currently Working on my Productivity Monitoring Setup and this information was Helpful. You can also convert emailed notifications into SMS using ifttt.com for free. You may be limited to a max number of SMSes per month (10 at the time I posted this). But you can also install the ifttt app on your phone and have it send you unlimited notifications via the app. ifttt can be leveraged in so many other ways. it is an excellent service if you are moving towards automating your home and everything. AtHome is pretty good, if really basic. Webcams are monitored by your phone app. Great if you only need to stream to one phone only. I used to use skype on auto answer but it no longer works since the last update. So i made this. I want to share since it is open source and free to use. Would be swell if you guys could give me your thoughts/opinions. 2) Allows remote access (via browser). So I have spent several days before I finally found the software that meets my needs: Security Eye. It’s really 100% free and it has all features of commercial (or “professional”) versions of video monitoring products. Second this motion: Security Eye has done what I needed in a very simplistic manner. Free and great. Security Eye should have absolutely made this list. where can i download this? how many cams can i connect also? thanks! This software does not do any of these things without purchase of the PROFESSIONAL product . Yeah, Security Eye is not free. Won’t do anything really until you buy the pro version. Contacam found 3 of my cameras and starting recording easily. However, Contacam apparently doesn’t recognize 264 cameras. It found 3 of mine, but not the N.264 one. There is a workaround, but cumbersome. Also, getting motion detection to work is hard. Sighthound could not find any of the cameras. Which software has App. for smartphone as Android, iOS…? At first glance, Camera Viewer Pro worked for my webcam and looks pretty good. Nevertheless thanks for the very comprehensive and helpful review of the apps available. You should check out kerberos.io as well :) It’s great and easy to install. Does anyone know if any of the listed programs provide CCTV diagnostics and system failure reporting? SecureCam2 does images (up to 15,000 in 1 calender day) as well as video. I’ve been using it for 5 years or so for home sur. Donated the $5, never heard a peep, been promising SC3 for 4 years or more … 12oclocksoftware IIRC. It seemed that the Camera Viewer Pro seemed to want to download something from the defunct website in order to install. I manually installed it and got it running, but the web services would not start. Later when starting, it just refused to display anything on the screen. It would show up in task manager though. I next tried Netcam Studio and found it to be fairly awesome and they even have and Android app. Thanks for this helpful write-up Raymond.CC.Blog! I found a interesting project recently, it’s called Kerberos.io. You can install it on a Raspberry Pi, and it takes images when motion has been detected. Everything can be configured by using a web interface. It looks fancy aswell. Which one of these programs is best to send a alert to my cell phone by email with pic from snap shot of camera . Genius Vision works really well. I certainly did not find setting up too difficult. I’m running a number of cameras over a wireless network for a community safety project monitoring routes criminals use. I was searching for this in internet and fabulous to find this great information here, the feature comparison table gives me fairly good idea, I hope all these software work nice with Win 8.1 and also in future can I read similar article on Android phone camera surveillance. Installed the webcam with your guide and it works great. I have it looking at a room and at 85% sens and 30% tolerance I get some shadow alarms in the morning, but that is ok. I put a attractive box where the camera can see it. I just check the last image in the email and if the container is how it should be and the drawers on the hutch are all in, I’m confident that it is a shadow alarm. I might play with the settings a little more, but satisfied. Note: it is not a video (obviously), so even if it shoots as fast as it can, if the person does not pause in view you might miss them. Put something attractive to make them pause in view. House was broken into today. We live in an active neighborhood and two neighbors were home but did not see anything. Dash and Grab, cash and gold only. Thanks Cash4Gold for fencing goods, I guess it makes the dvd, computer, etc too much of a hassle when they can safely fence gold no problem. Fixing door tomorrow and installing webcam with this plan. The FTP works well if in near real time so it can upload pic before they steal the computer.. assuming they come back for the stuff the saw while here the first time. Well done, as usual sir. Very nice tutorial, will come handy. Great for away vacations. Thanks! Nice one Raymond – thank you for an excellent article. I’ve been waiting for this kind of program for a while thanks so much!!! Only a geek like you can only post this article.. Thanks this will work well with AT&T as they offer their own email-to-text service for free. Very detail tutorial on setup webcam as motion detector. I believe it will reduce the burglar happens if everyone take it seriously. Thanks for great sharing.